Sam Brackenbury and Daniel Esterman handcuffed to bus! 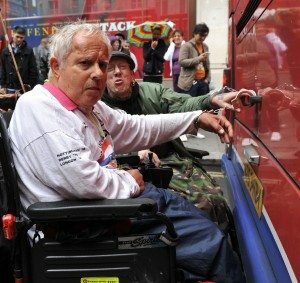 Members of the Greater London Pensioners’ Association stood in front of the bus holding placards. 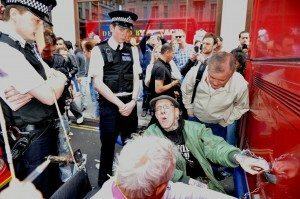 They said they were “taking direct action” against cuts for the disabled and elderly. “I have had cuts to my heating,” he said. “The bus passes will probably be next. “I’m not protesting for my own benefit but for all the disabled people who will be affected,” he said. “There is a lot of publicity that goes into talking about people who are on disability benefits being scroungers, but it is a smokescreen to get people off benefits to cut costs,” he said.